The European Trade Union Confederation, ETUC, criticises what they see as poor correlation between the OECD's macro-economic analysis and the strategic recommendations given to individual member countries. The advice does not reflect a new narrative about inclusive growth. "Be consistent," encourages Luca Visentini, the ETUC General Secretary when he meets the Nordic Labour Journal during OECD forum. "Low wages are still there, there are still poor workers and poor working conditions, so we have to do more to make sure the weak growth turns into sustainable growth which includes everyone. This is the problem which is still not being addressed in practice." In the swarm of people moving between conference rooms and debates, we have an appointment to meet the ETUC General Secretary. The talk, dark man and his guide in a red dress are not difficult to spot. His handshake is, like his presence in the room, direct and clear. We sit down in the press room where it is possible to have an undisturbed conversation. Still somewhat surprised with OECD Secretary General Angel Gurría's powerful opening remarks about the need for a new world image and for changing ideas we have become accustomed to, the question is how Visentini felt about it all. In his view, the recommendations do not reflect the new narrative which includes concepts like “resilient, sustainable and inclusive growth”. The OECD Forum is a venue for debate, focusing on new economic, employment and social trends. It is not a tripartite forum, but ETUC is represented in nearly all the Forum’s panel debates. The same goes for representatives for business, through the Business Advisory Committee. 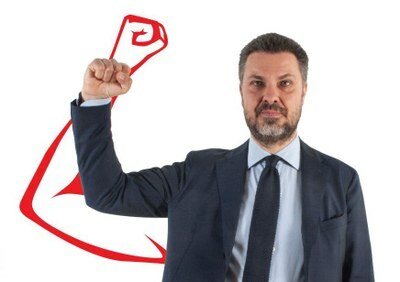 The ETUC General Secretary thinks the parties are becoming increasingly open to the trade union movement’s arguments, listening more to the social partners. The OECD’s new view of reality, or the new narrative as it is called, is not limited to the OECD alone. It colours several international fora and centres on a reckoning with the classic understanding that economic growth leads to equality. This is wrong. The way things have developed since the 1970s shows that the opposite is the case. That is why this trend towards greater inequality must be turned around, and there needs to be a new narrative where economic growth will be made more resilient to economic shocks, includes everyone and promotes sustainability. “When we speak to Christine Lagarde and Jim Yong Kim, we also see that for institutions like the IMF and the World Bank, fighting inequality with investments, education, training and promoting human capital is key. This needs to be in place to achieve economic progress and equality. “There is a very interesting development on a global level. But then we have those who travel around giving advice, who take a completely different approach,” says Luca Visentini. ETUC recently tweeted a picture of a banner reading ‘Collective Bargaining’. Can you explain? “First we agreed on three priorities: Investments to help the economy recover, increasing wages to restore internal demand and to improve social cohesion by promoting a well-functioning welfare system. Negotiations and collective bargaining are key to achieving this. Right now the challenge is to get the new member countries from the East – The Baltic states, the Visegrád group and the Balkans – to establish a framework for collective bargaining on a national level. “The social partners cannot do this alone, without a push from the public authorities,” says Luca Visentini, and adds the EU Commission is also stating to accept that such a framework is needed, and that some governments are starting to agree too. Something is starting to happen. The crisis destroyed everything, and now the framework for collective bargaining needs to be rebuilt, just as it was included into countries’ frameworks in the wake of WW2. The Nordic region is to a certain extent the exception, he says, but both the Finnish and Danish governments have partly destroyed established systems. Even in Germany the system was destroyed. Collective bargaining now covers fewer than 25 percent of workers. Which issues is ETUC prioritising at the OECD Forum? “Investments, just transition, not only for climate change but also for the technological development with digitalisation and automation, to make sure no-one is left behind. If ten jobs are destroyed because of technological change, eleven might be created, depending on investments of course. We also have a big, global campaign to increase workers’ pay and generally increase minimum wages. This is very important, he insists. Working with the European Pillar of Social Rights and the ILO’s initiative The Future of Work is also at the core of what is needed in order to reduce social inequality and promote social inclusion. These are the key factors. But how do you do this in practical terms? It is not easy being an optimist in a world of terror, war and crisis, refugees, racism and lack of democracy in many countries. Nevertheless, Luca Visentini highlights some positive developments. “There is a slight economic recovery going on, employment rates are growing a bit and we have this change of narrative: The new story about what is needed to create progress, resilient, sustainable and inclusive growth. But what about the USA’s new direction and Brexit? President Trump has managed to become very unpopular with the United States Trade Union, the American union which is also represented in TUAC, says Visentini, and refers to his fellow American trade unionists. “Their view of Trump is that he never keeps any of his promises. Trump was supposed to create jobs, but we have not seen them. He was going to invest trillions of dollars, but there is nothing there. There is not one dollar for public investments, there are just private public partnerships. “Yet paradoxically there could be a positive outcome of this. With Trump on one side and Brexit on the other, the rest of Europe has become more united. Also, Trump’s protectionism could have positive effects on multilateral financial institutions, which must set themselves more ambitious goals and promote their new and different narrative on inclusive growth in a much stronger way. Studied Philosophy at the University of Trieste. Has been involved in ETUC work since 1997. All these activities led Luca to the ETUC secretariat. Poetry and creative writing. Between 2004 and 2012 he published four books of poetry and novels, between 2004 and 2012. Visentini has also been a founder and chairperson of cultural associations and networks active in the fields of literature and theatre, which organise events, shows, plays, conferences, fairs and more. As the European Union has gradually increased its influence in the areas that most affect workers, Europe's trade unions in response came together to form the ETUC. Since 2008, Europe’s economic and financial crisis and the introduction of austerity policies have reinforced the need for a body to defend workers’ interests at EU level. The ETUC aims to ensure that the EU is not just a single market for goods and services, but is also a Social Europe, where improving the wellbeing of workers and their families is an equally important priority.